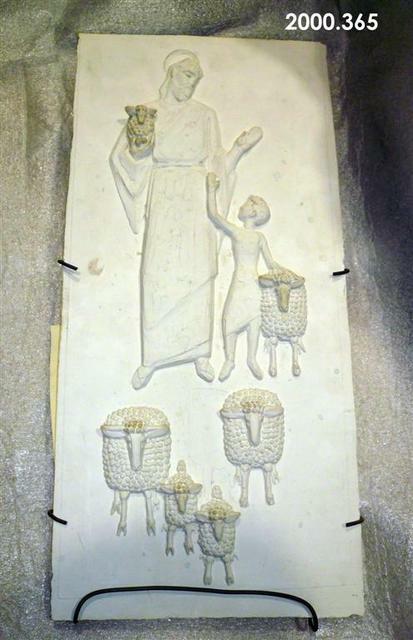 Plaster relief model for Christ the Good Shepherd. Model for 18 foot anodized aluminum sculpture located at Central United Methodist Church, Waterford, Michigan. Depicts Christ with a small boy at his side surrounded by sheep. Christ holds a sheep in his proper right arm. 25" x 12" x 2"
Fredericks, Marshall M., 1908-1998, “Christ the Good Shepherd, Relief, [Plaster],” Marshall M. Fredericks Sculpture Museum, accessed April 23, 2019, http://omeka.svsu.edu/items/show/6507.